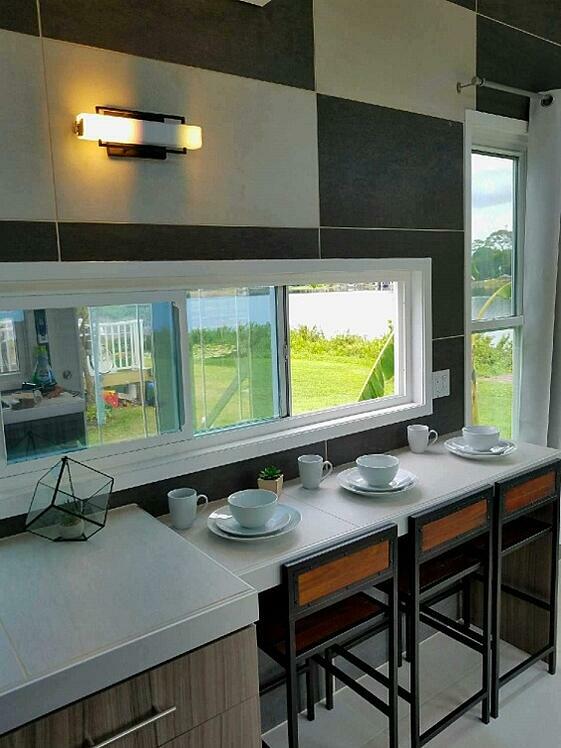 We caught up with Lauren Figueroa to learn more about her, the project and how she used tile in the design of her tiny home. LF: Gladly! I’m Principal Designer at The Georgia Pear Interiors, a residential and commercial design firm in downtown Grand Rapids, Michigan. Our vision at The Georgia Pear Interiors is to create functional and beautiful spaces that inspire creativity, lend themselves to community, and allow for rest and regeneration. CTEF: How did you get involved in designing Tiny Homes and the Installation Design Showcase? LF: I got connected with Coverings and the Tiny House project through Dan Welch, owner of Welch Tile & Marble here in West Michigan. Dan and his wife Doreen were actually design clients of mine, and when Dan found out about the project, he suggested I get involved. 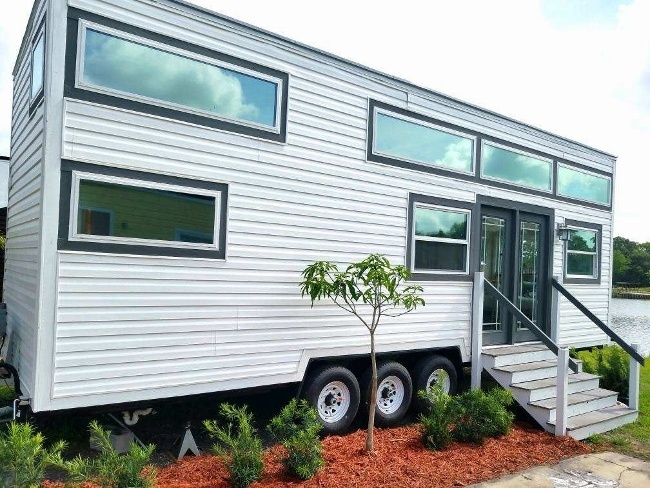 CTEF: What’s different about designing a tiny house compared to a regular sized space? How do materials fit in? LF: In a tiny house, one large space has to serve the usual functions of several different spaces. Because of that, I spent a lot of time with the color palate. I wanted to define the separate spaces without cutting anything off or overwhelming the senses with too many colors or patterns. In a regular house, you also have the space for a bed, and a table, and a couch, and, and, and..
To save space, we thought a lot about built-in features with multiple functions. For example, we designed a built-in sofa that would double as a bed, with lots of space for storage underneath. CTEF: What inspired your “West Michigan House” theme? LF: A showcase is a unique opportunity because you aren’t locked into the style of any one client. Our tile sponsor was Florim USA, so I decided to really let the product speak for itself. As I explored their products, I felt that Florim’s products most shined in sleek, clean, and modern spaces. In my initial research, I was poking around the Florim USA website and I came across a photo (pictured above) featuring the Basaltine line. There was something so clean and calm about this little vignette, and it ended up becoming the inspiration for the entire design. CTEF: What were the most challenging aspects of the installation project? LF: The most difficult aspect of the project was the fact that one hundred percent of our planning was done remotely. Our builder was located in Orlando, while Dan and I were in Grand Rapids. Until the first day on site, we had only ever communicated via email and conference call. It was nerve racking, because when working remotely, it becomes easy to miss little details. Luckily, we had an excellent team and were able to pull everything off! CTEF: Were there any last-minute modifications required? Very close to the end of the process, we were informed that we’d have to shorten our house from the originally planned 33-foot trailer to a 30-foot trailer. 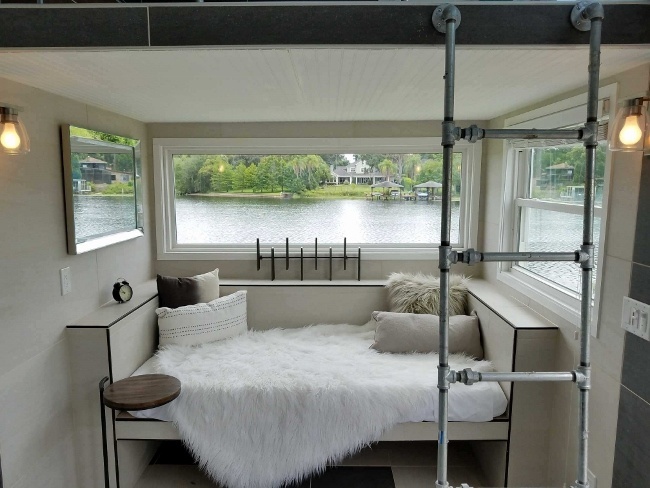 This doesn’t seem like a lot of space, but in a tiny house, it’s essentially a whole room! You’ll see in our original design that we’d specified a three-paned sliding glass door. With losing three feet, we decided to change it to a French door in order not to lose our kitchen sink ;). 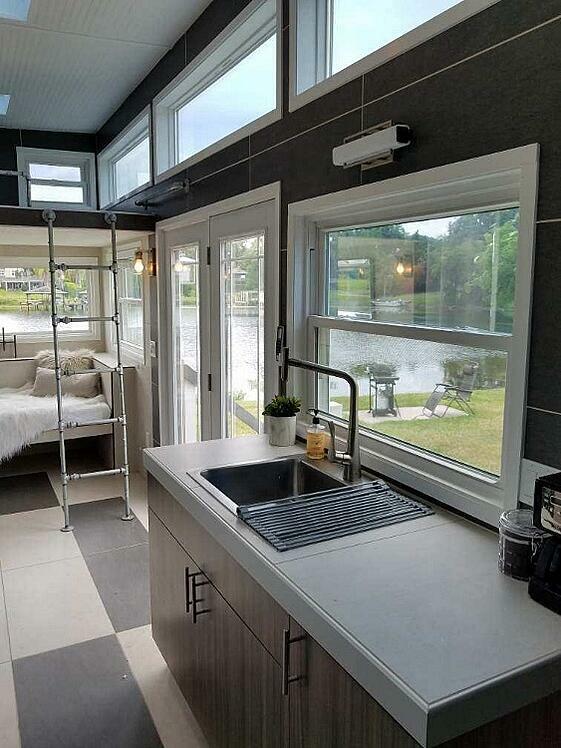 >> See Lauren's post titled Coverings 2017: The West Michigan Tiny House which includes the original designs. 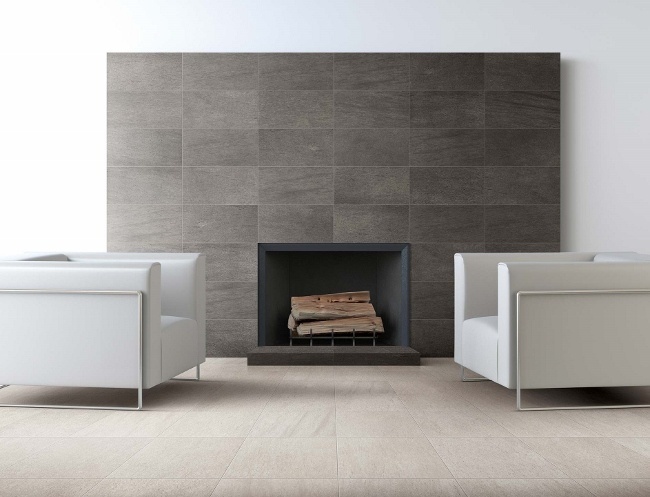 CTEF: What was it like working with as talented a team as Welch Tile? LF: Welch Tile made the process incredibly easy. When I arrived onsite the first day and saw what they had already accomplished, all my anxieties about the project dissolved. I knew the project was in good hands! 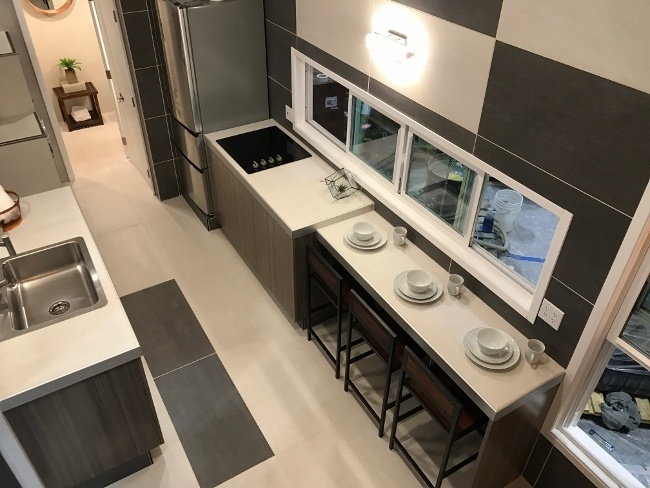 CTEF: What kinds of challenges do you regularly encounter when it comes to the tile designs you create? 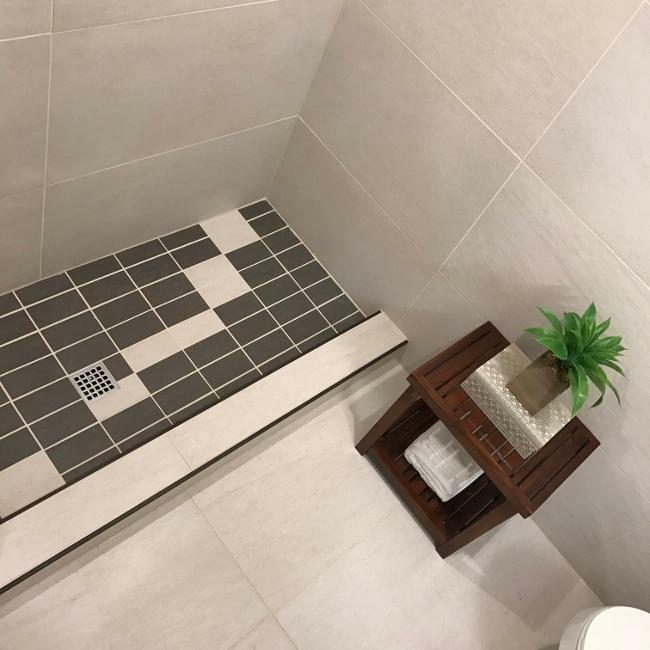 LF: Tile designs are a fun challenge because there are so many details to think about, even when designing small spaces: the layout of the tile, grout color, function of the space, size of the tile, cutting the tile to fit the space, the list goes on! CTEF: What’s your reaction to completing this Installation Design Showcase project? LF: I feel an incredible sense of pride and accomplishment at completing The West Michigan House. It taught me a lot about problem solving, working with a large team of skilled professionals in a short amount of time, and how to partner with industry professionals to get the best possible design. I also feel that this project allowed me to explore my personal design style. It’s easy to get caught up in the style of the clients you work for, so it was liberating to have complete creative freedom on this space. CTEF: How can readers learn more about you? LF: Email is a great way to get in contact with me, Lauren@thegeorgiapear.com. Readers can also check out our blog (www.thegeorgiapear.com/blog) or follow us on Instagram at @thegeorgiapear. 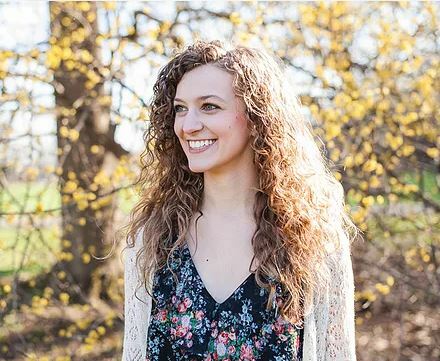 CTEF: Thank you, Lauren, and congratulations! Did you get to see the West Michigan Tiny House at Coverings17? What did you think of it and how the tile accentuated the design? 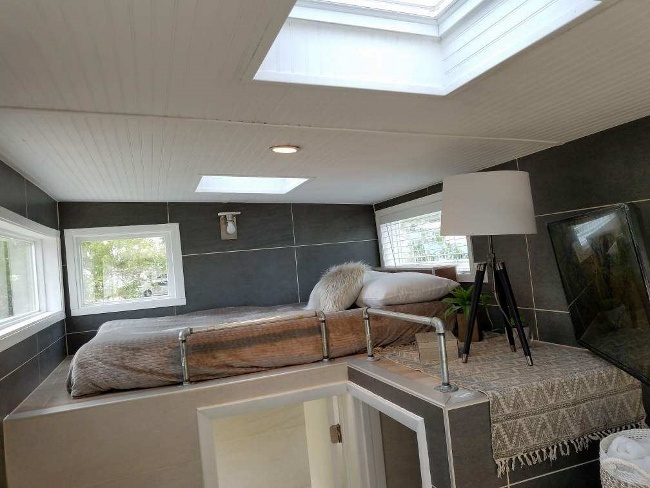 How might you use tile in a tiny home?